With its striped Vespa scooting into Bangsar, Eatalia has launched its second branch this month, bringing a bit of Tuscany to Telawi. The restaurant has long nurtured a loyal following at its original birthplace in Desa Sri Hartamas, so this is a welcome expansion for Bangsar-based fans of Italian fare, with an extensive selection that'll take customers from pesto to primavera, pollo to panna cotta. 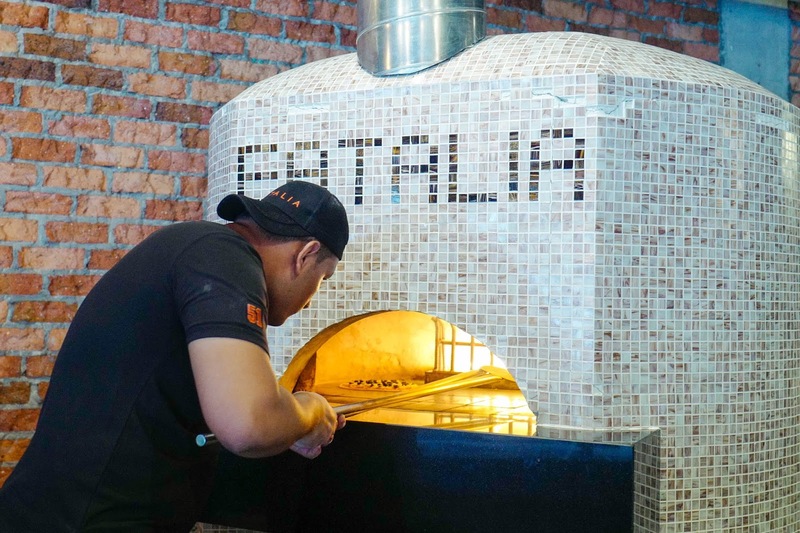 The wood-fired oven at Eatalia's entrance is evidence enough that pizzas are a priority here, with about two dozen varieties on the menu, meticulously prepared on crisp, lightly smoky crusts. With swoon-worthy names that span Casanova to Romeo to Juliet, these are pizzas intended to ignite a lifelong romance with Italian cooking, be it a Mediterranean vegetarian ensemble of olives, oregano and garlic, robustly savoury and aromatically layered with mozzarella and tomatoes (10-inch pictured here for RM20, or 12-inch for RM27), or the Bresaola, blanketed with salted air-dried beef, rocket leaves and hints of truffle oil for an unmistakably Italian creation (10-inch for RM28, 12-inch for RM35). Calzones, the Naples-origin folded pizzas, are also available; named for the Baroque concertino instrumentals, the Calzone Ripieno is a harmonious half-moon of beef bacon, mushrooms, cheese and tomato sauce packed within the pizza, ensuring fully loaded fulfillment for peckish patrons (10-inch for RM22, 12-inch for RM29).